The NATO Tiger Association is well known among aviation enthusiasts, with their annual exercises always including popular events for photographers with the star of the show alwaysbeing the variety of colourful tiger paint schemes. This year’s exercise was one of the largest in recent years, with aircraft from 14 countries participating. Peter Reoch reports from Zaragoza. The problems started early in the morning, when visitors were briefed that, instead of the advertised 6pm end time, spotters would be turfed off the base at two in the afternoon. Considering the main mission wave was to be flown in the afternoon, and the sun didn’t swing round to the southside of the runway until midday, this news was the cause of much anger among those present. This was increased when it became apparent how great the dedicated "spotter" access to the runway was, and how perfect the conditions would have been come the afternoon. For the morning launch, most sensible photographers opted to positioned themselves to the rear of the spotters enclosure, to shoot the aircraft on the southern taxiway, making use of the light conditions as best they could. However this caused more issues with the Spanish hosts, who insisted on 50m separation from the taxiway edge - even though there were thick bushes and undergrowth about 25m back from the taxiway! Despite explaining to the military police the difficulty in photographing aircraft when they’re obscured by trees, no allowances were made, so many photographers ended up photographing the passing jets in between bushes which was not ideal. Still, it was better than photographing the departing jets in horrible backlit conditions. 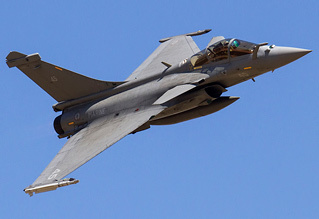 The morning wave included nearly of all the special schemed aircraft at Zaragoza, with the Turkish and Belgian F-16's being the most striking of the special schemes present. Thankfully, during the morning, the NATO Tiger Association representatives had negotiations with senior staff from the Spanish Air Force who allowed us to remain on the base. However, we were not allowed to return to the spotters area close to the runway for the afternoon, instead being located in an area to the south of the taxiway, where, yet again, this area was ridden with undergrowth and large bushes which posed issues for photographing aircraft taxying past. Nevertheless, even with the issues and challenges, the assortment of aircraft operating on the day was impressive for all visitors with some 60 aircraft launched during the afternoon mission. Exotica such as two French Navy E-2C Hawkeyes, Hellenic and Turkish F-16C Fighting Falcons and French Army Gazelles were the highlights of the day's operations for the majority of visitors. 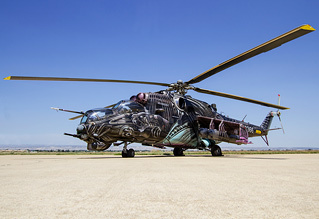 The appearance of Hips & Hinds is always warmly welcomed, and it was no great surprise that the Czech Air Force won the award for the best painted aircraft, with their opinion-splitting ‘Alien Tiger’ paint scheme Mi-24 Hind. That airframe was accompanied at Zaragoza by Hind '3370' in it’s RAF Liberator paint scheme as seen at RIAT 2015. During the afternoon there were a number of aircraft arrivals ready for the Open Day, with two German Tornados (who were not participating in the exercise for the first time in a number of years) being the first visiting arrivals. The sight of a Canadair CL-215T and a CASA 212 Aviocar arriving at Zaragoza then gave positive signals that the Open Day may host some other Spanish military aircraft on the static display; this turned out to not be the case, however. 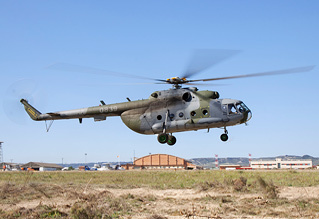 The lack of assets from the hosts was a disappointment for many foreign visitors, with most having modest expectations of at least a small number of aircraft on display from the host nation. Perhaps the most annoying element of the static display was that a pair of F-16A belonging to the Portuguese Air Force arrived late on Friday afternoon (after photographers had left the base), but were not positioned into the static display so visitors were unable to view them. Despite the lack of representation in the static displays, the home team made up the majority of the flying displays for Saturday’s Open Day. 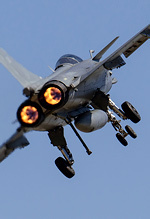 Both the EF-18A and Tifón performed solo displays, which to the experienced eye seemed to model themselves more as ‘role demonstrations’ with a sequence of manoeuvres rather than a single, flowing flying display sequence. 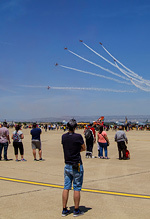 However, both aircrafts' routines would have presented a vast number of photo opportunities, had they not been flown when the crowd was facing the sun. 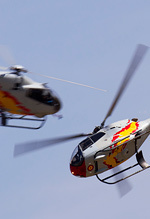 Of course, Patrulla Águila & Patrulla ASPA both performed full displays at the Open Day, with the Spanish crowds enthralled by the both teams. It must be said that both teams appeared much punchier than displays seen in the UK in recent years. Displays from Tiger Meet participants included the F-16AM solo display from the Belgian Air Force which, sadly for some, used the ‘Blizzard’ special schemed aircraft rather than the squadron’s beautiful tiger jet and a pairs role demonstration from two Rafale M aircraft. The display from the French Navy was everything that an enthusiast lusts after from a fast jet demonstration: thrilling high speed passes, plenty of afterburner and genuine excitement throughout the display. Overall, the two days at Zaragoza were extremely enjoyable, despite the various annoyances with access. It was disappointing that the poor communications and changes in promised access overshadowed the weekend’s activities. However it is hard to undermine the impressiveness of the sheer number of aircraft present, and the impact of the incredible paint schemes which were on show.